One of our Church partners, Trinity Bible Church, brought hairdryers, straighteners, and shampoo for our ladies! Thank you for a special blessing! 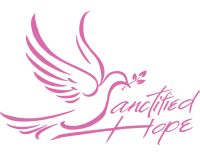 Sanctified Hope celebrated our Inaugural Graduation! What an absolute blessing it was to celebrate our first graduate, Deana! Our originating Director, Sue Moreland was the keynote speaker. Deana was recognized for all of the wonderful accomplishments that she achieved during the year she spent with us! Congratulations Deana! !